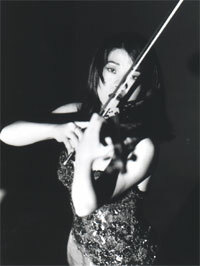 Ms. Takezawa has performed as soloist with such prominent ensembles as the New York Philharmonic, the Boston Symphony, the Philadelphia Orchestra, the Chicago Symphony, and the symphony orchestras of San Francisco, Cleveland, Baltimore, Saint Louis, Houston, Toronto, Dallas, Montreal, Detroit and Cincinnati. Abroad, she has been heard with the Academy of St. Martin in the Fields, the London Symphony, the Tonhalle Orchestra of Zurich, Bavarian Radio Symphony Orchestra, the Dresden Staatskapelle, the Royal Concertgebouw Orchestra, the Royal Scottish National Orchestra, the Leipzig Gewandhaus Orchestra, Orchestra National de Radio France, Lyon and also Nice, the NHK Symphony, the Tokyo Metropolitan Symphony and the New Japan Philharmonic. She has collaborated with many distinguished conductors, including Seiji Ozawa, Sir Colin Davis, Michael Tilson Thomas, Wolfgang Sawallisch, Kurt Masur, Sir Neville Marriner, Leonard Slatkin, Charles Dutoit, Marek Janowski and Sir Andrew Davis. She has performed at major venues around the world, notably Carnegie Hall in New York; the Kennedy Center in Washington, D.C.; London’s BBC Proms; Musikverain in Vienna and Suntory Hall in Tokyo. In recent season, Ms. Takezawa has made her debut appearance with Magdeburg Philharmonic Orchestra in Germany, Mito Chamber Orchestra in Japan, Spring Festival in Korea, Music in the Vineyard Festival, Santa Fe Festival, Music @ Menlo Festival and Saratoga Spring Festival in USA. Also she was the jury member of the International Violin Competition of Indianapolis, Concours international Marguerite-Long-Jacques-Thibaud, Sendai International Competition and the International Wieniawski Violin Competition. In past seasons, she has performed with the Vancouver Symphony , the West Australian Symphony , the Amarillo Symphony and in Finland with the Kymi Sinfonietta, in Japan with the NHK Symphony, Kanagawa Philharmonic, Osaka Century Orchestra, Japan Philharmonic, in North America with the St. Louis, Tucson and Jacksonville, Charlotte, Toronto and Seattle Symphonies. She also performed with the China Philharmonic, the Hong Kong Philharmonic, the Japan Philharmonic, Singapore, Guangzhou, NHK Sym. Tokyo Metropolitan Sym., Tokyo City Phil. in Asia, Denmark’s Aarhus Symphony, France’s Orchestre National de Lille, and Manchester’s Halle Orchestra. She also appeared as the feature soloist on the Hamburg NDR Symphony tour of Japan. A highly accomplished chamber music performer, Ms. Takezawa has participated in the Grand Teton Music Festival, the Aspen Music Festival , the La Jolla Chamber Music Festival and the Casals Festival in Prades., Hong Kong International Chamber Music Festival. Also she has been a regular guest for the La Folle Journee Festival in Japan. Ms. Takezawa’s chamber music performances have drawn high praise, and as co-director of the Suntory Festival Soloists of Suntory Hall in Tokyo, she has collaborated with the late Isaac Stern, Yo-Yo Ma, Wolfgang Sawallisch, Joseph Suk and many other distinguished artists. A prolific recording artist, she has just released her most recent CD which she performed all Brahms’s Violin Sonatas with pianist Itamar Golan by Sony Music Japan. Other recordings are heard on BMG’s RCA Victor Red Seal label, a recital CD titled ‘Romanza’ which she performed short pieces, performances of the Concerto for Violin and Orchestra, Op. 14, by Samuel Barber with Leonard Slatkin and the Saint Louis Symphony Orchestra, the Brahms Violin Concerto and the Elgar Violin Concerto with Sir Colin Davis and the Bavarian Radio Symphony Orchestra; the Violin Concerto No. 2 by Barto´k with Michael Tilson Thomas and the London Symphony; and the Mendelssohn Concertos Nos. 1 & 2 with Klaus Peter Flor and the Bamberg Symphony. Ms. Takezawa’s CD of French violin sonatas was selected as one of the best recordings of 1993 by Stereo Review. Most recently, her new CD of Brahms Complete Violin Sonatas with Itamar Golan has released from Sony. Ms. Takezawa has numerous television credits includes ‘Concerto!’ the program which she performed Bartok’s Second Violin Concerto guided by Dudley Moor by BBC channel 4 , morning show by A &E and two hour documentary program by TV Aichi in Japan. Ms. Takezawa began violin studies at the age of 3 and at 7 toured the United States, Canada and Switzerland as a member of the Suzuki Method Association. In 1982 she placed first in the 51st Annual Japan Music Competition, and at 17 she entered the Aspen Music School to study with Dorothy DeLay, with whom Ms. Takezawa continued to study at The Juilliard School until graduating in 1989. 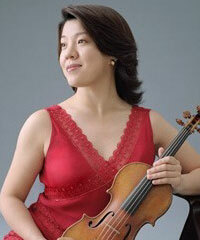 In 1986 she was awarded the Gold Medal at the Second Quadrennial International Violin Competition of Indianapolis. As a educator she is on the faculty of Toho Music School in Japan and served as a jury for the International Violin Competition of Indianapolis and Menuhin. Most recently, she received the prestigious Idemitsu Award for outstanding musicianship and Aichi Art Cultural Award. Incarnation me^me de la musicalite´, la violoniste Kyoko Takezawa subjugue son audience par la richesse de son jeu sa virtuosite´, son expressivite´ d’une rare intensite´ passionnelle ce qui la classe parmi les plus grandes violonistes actuelles et les plus demande´es sur la sce`ne musicale mondiale. Elle a enregistre´ de tre`s nombreux disques pour le label RCA (Concerto de Barber avec Leonard Slatkin et Saint Louis, Concerto d’Elgar avec Sir Colin Davis et la Radio Bavaroise, 2e`me Concerto de Bartok avec Michael Tilson Thomas et l’Orchestre Symphonique de Londres, Concertos 1et 2 de Mendelssohn avec Claus Peter Flor et Bamberg…) Son CD de´die´ aux Sonates Francaises a e´te´ se´lectionne´ parmi les meilleurs disques en 1993 par la revue 《 Ste´re´o 》. Kyoko Takezawa a commence´ les e´tudes de violon a` l’a^ge de 3 ans et quatre anne´es plus tard, elle faisait sa premie`re tourne´e aux USA, Canada et en Suisse comme membre de la Suzuki Method Association. En 1982, elle s’est classe´e 1e`re du Concours Annuel de Musique au Japon et elle a inte´gre´ l’e´cole de musique d’Aspen alors qu’elle avait 17 ans pour travailler avec Dorothy DeLay avec qui elle a continue´ a` se perfectionner a` la Juillard School a` New York d’ou` elle est sortie diplome´e en 1989. Elle enseigne aujourd’hui a` l’e´cole de musique Toho au Japon et elle a e´te´ membre du jury du Concours d’Indianapolis. Plus re´cemment, elle a recu le prestigieux Prix Idemitsu pour ses qualite´s exceptionnelles.